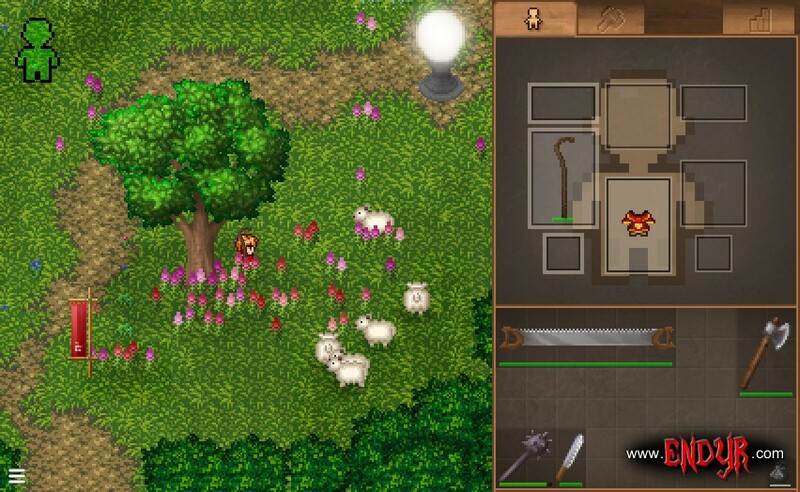 Endyr is a MMOSG (massive multiplayer online survival game) presented in detailed 2d "retro" look. The basic idea of this game is players working together in order to survive. This is achieved by finding and gathering resources, forging swords and armor and realtime battles against enemies or other players (for training). All information in this Wiki is completely provisionally. Implementation not guaranteed. Once there was a peaceful world living in endless daylight. But one day the sky became darker and eventually it was night – for the first time in history. Dangerous creatures, only yet known from dark caves, appeared literally everywhere and went against the peaceful people of Endyr. Not knowing how to fight or defense themselves most of them were slaughtered without mercy. Only when the last group was awaiting their fate the darkness slowly disappeared and all the monsters burned in the bright sunlight. The survivors celebrated the new day. This is the story of those who were lucky this time. But what if the night returned one day? Would they be prepared and survive one more time? Would they step into the caves in order to gather resources for forging weapons and armor? It's all in your hand. Mouse: Click your right mouse button to move in a short range (small obstacles are being avoided automatically). For greater distances press and hold the right mouse button. The character will follow the cursor until the mouse button is released. Instead of right-clicking you may also hold the left mouse button (for about 2 seconds). Touch: Touch and hold the finger down for about 2 seconds. The character will then follow the finger until while it's touching. All interactions are done by left-clicking or touch. Mouse users may hover a target to see it highlighted in color. Red means attack, blue means gather resource, yellow means other actions and bright yellow tells you the target will open a menu to let you choose. If there's no highlight then there's no interaction possible. If the target is out of reach the player will try to walk there first. Menus can be cancelled by clicking on a free spot. In order to fight you first need to equip a weapon in your primary hand (thick border). For ranged weapons you'll also need ammo (slot above the weapon). If this is done enemies will be highlited in red. Now click on a enemy to attack. If nothing happens the enemy may be out of reach or the weapon might be broken (red background). As soon as they're being attacked enemies will chase you and fight back as soon as they can reach the player. Equip your bombs as if they were ammo. Light a torch in your hand, then click near your charater to place a bomb. Run (or click the bomb to disarm and collect). Endyr knows different damage types such as slash, pierce, bludge, fire and so on. Enemies may be affected differently by each of these damage types. Typical example: Skeletons get only half damage from piercing damage while dryads get double damage from fire weapons. If a weapon can act on different damage types (like slash or pierce) the type that causes the most damage will be used. If a body part is completely damaged (0 points) attacks won't affect the health bar anymore. You may cancel the crafting at any point without losing resources. If there are enough resources the player will continue crafting multiple items. The plant window will show you the water level (on the left) and the health (ring around the plant). If the water level is good (blue range or at least orange range) the plant will get healthier. After some time the plant is grown and can be harvested by clicking on it. In order to write a message you first need some pen or charcoal. Equip some paper to your ammo slot, then equip the pen (to the same side). If done right the paper window appears. 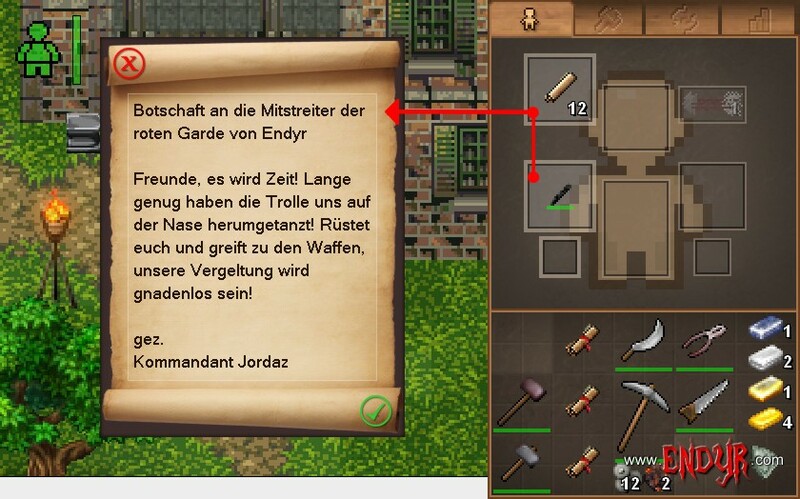 Write your message and click the green hook to create the scroll item. To write another scroll, equip the pen again. You'll start within the safe castle. Follow the way to the left to get outside. Find rock walls to gather slate stones and get some branches from a tree to build your first improved tools. When done have a look at the mine farther in the west. There you may find iron ore which can be smelted into iron ingots. These can be melted into a forge hammer, which is your basic item for forging iron swords (don't forget the wooden handles).